The power of the mind is a New Age staple. 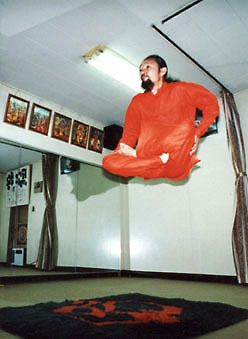 But really, can I concentrate enough to levitate myself (much less get my laundry done today)? The materialist answers, funny you mention it, but, yes, you can. A few minds thought through the ideas that produced the airplane and perhaps soon enough the personal jet pack with smart phone dock and coffee maker. The dialectical materialist would modify science’s self-congratulations with the observation it’s taken many generations’ labor to produce the surplus permitting a few their deep thinking. Ingenuity is itself a social object. And yet, despite, or perhaps because of, that backing, we can think ourselves into era-specific traps. Among these include animal and plant diseases that rope-a-dope us into a frustration we feel obliged by our lords and masters to fail to understand.